Larry Coker was one disputed pass interference call away from leading Miami to back-to-back national championships in 2001 and 2002. Now, he’s the color analyst for ESPNU and has covered three of Duke’s games this year—its wins over Navy and Virginia and its loss to Georgia Tech. The Chronicle’s Ben Cohen caught up with Coker Tuesday to discuss his impressions of the Blue Devils, his recruitment of Duke defensive lineman Vince Oghobaase and his prediction for this weekend as Duke welcomes the Hurricanes. How does this year’s Duke team compare to the teams that you coached against? I think it’s probably the best that’s been around in a few years. You’ve seen the pass-catch combination of Thaddeus Lewis and Eron Riley three times this year. What kind of potential do they have on the next level? They have a lot of potential, they could be Sunday-type players, especially if Lewis can get some help with the running game—it’s going to make him a lot better. I know Harris is doing a pretty good job, Hollingsworth did a nice job the last time I saw him [against Virginia Sept. 27]. I think [Lewis and Riley] are both Sunday-type players. Given linebacker Michael Tauiliili’s season so far, is he the favorite for ACC Defensive Player of the Year? I don’t know that—I know he has all-league potential. Vince Oghobaase, too. Were you surprised Oghobaase came to Duke instead of other highly touted programs? Yes, I think it was a decision he and his family made for his eduaction and for the right reasons, but i was surpsirsed. I thought he would probably end up… it was Duke or [Miami]. I thought we were going to get him. Can all the changes from this year’s team to those of the last few years be attributed to change at the top of the program, starting with Cutcliffe? Well, it was the previous staff that recruited these players. Ted Roof did a really good job recruiting and this was kind of the year that he had built for. But the new staff and attitude of David Cutcliffe and the stamp he puts on this team and the staff he’s put around him—it just personifies those good players that have matured. How difficult is it for Lewis to succeed if he doesn’t have a legitimate running threat? It’s pretty hard. You’re going to get a lot of different pressure. If you can run the football, it makes a lot of difference how you put pressure on the passer. I think it’s pretty hard to just be a good passing team and not being able to run the ball. What are your thoughts on this weekend’s Duke-Miami matchup? Miami’s got a lot of talent. That’s going to be the key, whether Duke can protect the quarterback. If they can, they’ll have some chances in the passing game. Defensively, Duket is pretty good. Javaris James, the running back, will help Miami. Miami didn’t play well last week, so they’ll want to step out of the shell and play great. It’ll be a challenge for Duke—it’ll be a really good game. It’s kind of a tossup game. Senior wide receiver Eron Riley, who was listed as questionable with a hand injury, will start this afternoon against Georgia Tech. Yellow Jacket starting QB Josh Nesbitt, however, did not dress. Jaybo Shaw will start in his place. Duke senior wide receiver Eron Riley is listed as questionable for Saturday’s noon game at Georgia Tech because of a hand injury he sustained during midweek practice. The team’s injury report went out today, and Sports Information Director Art Chase confirmed the time of the injury. Riley, who leads the ACC and is third in the nation with six touchdown receptions, was previously listed as probable for Duke’s Sept. 13 game against Navy. He played, and score three touchdowns in the process. This week’s game has extra meaning for Riley, who hails from Georgia and was snubbed of a scholarship offer from the Yellow Jackets. 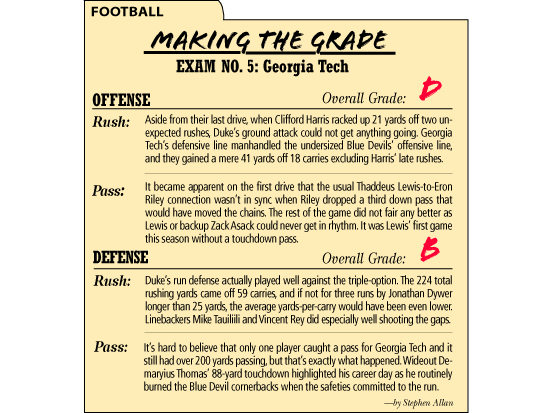 And given quarterback Thaddeus Lewis’ comments Tuesday, we would expect Riley to be burning Georgia Tech cornerbacks in Atlanta come Saturday. Fifth episode of Talking Football, this time filmed on the Bryan Center Plaza. Both Cohen and Iles pick Georgia Tech to beat Duke, and for different reasons. Some points of discussion: the Yellow Jackets’ triple-option offense, how playing Navy will help Duke and whether Georgia Tech’s defense can stop Thaddeus Lewis and Eron Riley. Feel free to offer your thoughts in the comments section below.